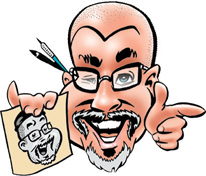 I'm Bill, and I'm a caricature artist from the Quad Cities. I've got over 20 years of live-event experience and lots of satisfied customers from private commissions around the world! Want to be a superhero? A spy? A princess? A pirate? The star of your own comic book cover? Pictured with your favorite star? I can do that! Caricatures make unique birthday gifts! "These drawings made so many people laugh and smile! So glad (Bill) was at our wedding! These caricatures will be something that will be kept forever!" - P.R. "Thank you so much! I really appreciate how quick you were with this (commission)! Definitely recommending you to anyone who wants something like this! :)" - J.F. "It was my daughters first caricature and the experience was amazing. She loved it so much we had to frame it for her. Thanks again from Alabama!" - N.G. "I'm so glad I had you at my wedding! You were my favorite part of my reception!" - B.W. 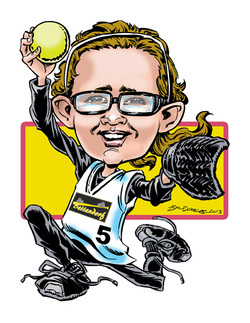 "I absolutely freaking love (my caricature)! It's the best gift I've ever gotten! Thank you so much!" - N.G. If you are interested in a commission in time for a special event or just for the fun of it, contact me right away to make sure your request gets in the queue. My event calendar for the summer and fall is filling up fast! Website and Content Copyright 2018 Bill Douglas, except where otherwise noted. All images featured at this website may not be reproduced in any form without permission from the artist.